Ireland is unquestionably a beautiful land. With diverse coastlines, remote valleys, wild mountains and ever changing scenery Ireland is certainly a paradise for walkers and hikers. Or it would be if walkers and hikers could actually walk there! 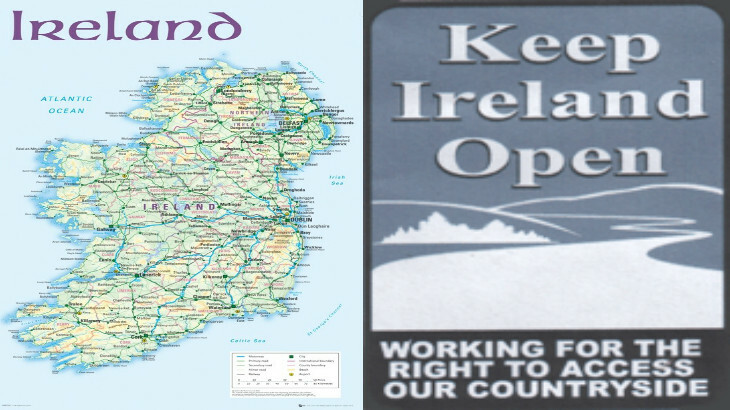 However, before we delve into the rights of private landowners, it seems Local Authorities in Ireland don’t have much incentive to keep rights of way open. The law which covers public rights of way in Ireland -the Roads Act 1993 – gives a Local Authority provision to extinguish any rights of way under Section 73 of the Act. What is telling here is Section 73.5 of the Act “where a public right of way over a public road or a part thereof is extinguished under this section, the road authority shall no longer be responsible for the maintenance of such road or part thereof with effect from the date on which the extinguishment of the public right of way comes into effect” (Source) This certainly seems to give Local Authorities a financial reason not to be pro-active in keeping rights of way open. But what about the creation of new public rights of way in Ireland? Well the Planning and Development Act, 2000 seems farcical insomuch as encouraging Local Authorities in developing new rights of way paths. “If, on a claim made to the planning authority, it is shown that the value of an interest of any person in land, being land over which a public right of way has been created… is reduced, or that any person having an interest in the land has suffered damage by being disturbed in his or her enjoyment of the land, in consequence of the creation of the public right of way, that person shall, subject to the other provisions of this Part, be entitled to be paid by the planning authority by way of compensation the amount of the reduction in value or the amount of the damage.” (Source) Basically, if a land owner says their enjoyment of their land is disturbed by the creation of a public right of way over their land then they can claim financial compensation. No wonder Local Authorities are reluctant to create or designate public rights of way! We begin to see how the laws of access favour the Irish landowner. But what about the rights of Irish landowners? In terms of the right to roam more generally, the Occupier’s Liability Act 1995 deals with entrants to the land in terms of the limits of landowner liability. It restricted their duty of care towards entrants to their land in several ways. This aspect of the law seems heavily weighted in favour of the landowner, even seeming to be a ‘non-law’ which you only need put up a sign to avoid – as is seen by the growing number of notices landowners are putting up asserting their rights of exclusion. An important proviso to consider, however, is where the Act adds ‘such a restriction, modification or exclusion shall not bind a visitor unless it is reasonable in all the circumstances’. But in a case of dispute, whose version of ‘reasonable’ are we to favour? The landowner’s or the entrant’s? Surely legal clarity is needed in this contentious area. 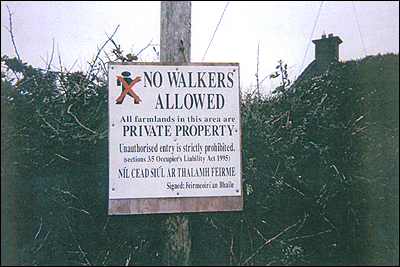 However, Section 4 of the Occupier’s Liability Act 1995 says when it comes to ‘recreational users’ specifically, including walkers and ramblers, then landowners have a duty only ‘(a) not to injure the person or damage the property of the person intentionally, and (b) not to act with reckless disregard for the person or the property of the person.’ This then circumvents the previous insurance liability concerns of landowners with respect to walkers. Therefore, even on the law as it currently stands, there is no legal substance in landowners invoking insurance liability as an argument against hikers, backpackers or even walking groups taking to their lands. 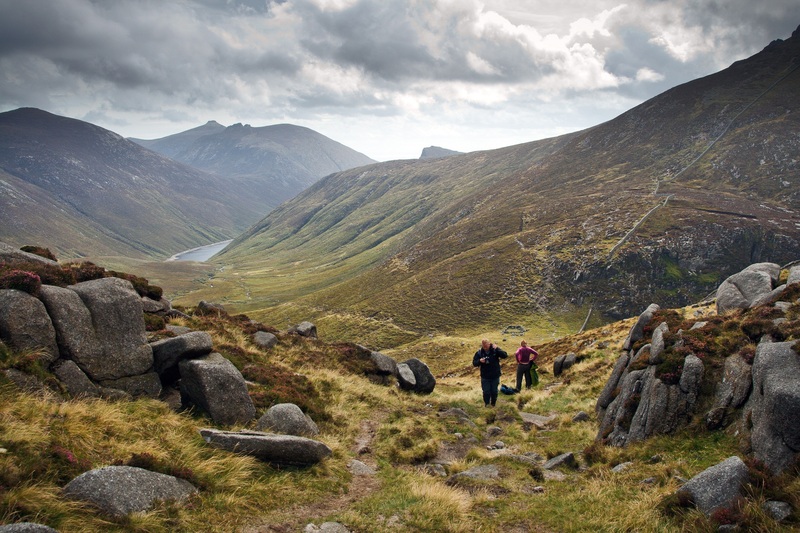 So, it would seem that a hiker, walker or rambler could legally roam across Ireland and the landowner doesn’t have to worry about potential insurance claims and is covered if any damage to his land is incurred by ‘recreational users’. However, an amendment to the Act seems to give the landowner a way to voluntarily ‘extend’ his/her liability to entrants and thus give the landowner yet another way to keep people off their property. Section 5 of the Occupier’s Liability Act 1995 is a ‘Modification of occupiers’ duty to entrants.‘ and states ‘An occupier may by express agreement or notice extend his or her duty towards entrants under sections 3 and 4′ (Source) This amendment can be seen in use in the picture above and is often cited by landowners in Ireland when defending their ‘right’ to keep people off their land. 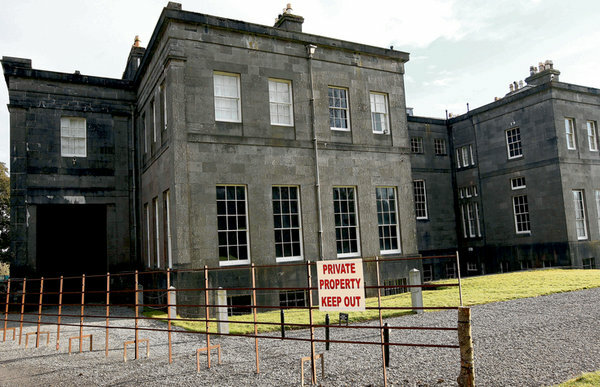 In one of the longest and most expensive property disputes in the history of the Irish state The Irish Supreme Court overturned a High Court judgement that there were public rights of way to Lissadell House estate in the Republic of Ireland. As a result of the council’s decision, the owners closed the estate in 2009 although it was attracting 40,000 visitors a year. They also let 11 staff go. This judgement means that it is now virtually impossible in Ireland to prove that a route is a public right-of-way exists across land unless you have a written dedication from a previous or current landowner deeming it to be so. This decision further erodes not only any rights to roam that may exist in Ireland, but also Local Authorities powers to protect existing rights of way. You can read more about the case here.. The Lissadell Judgement. 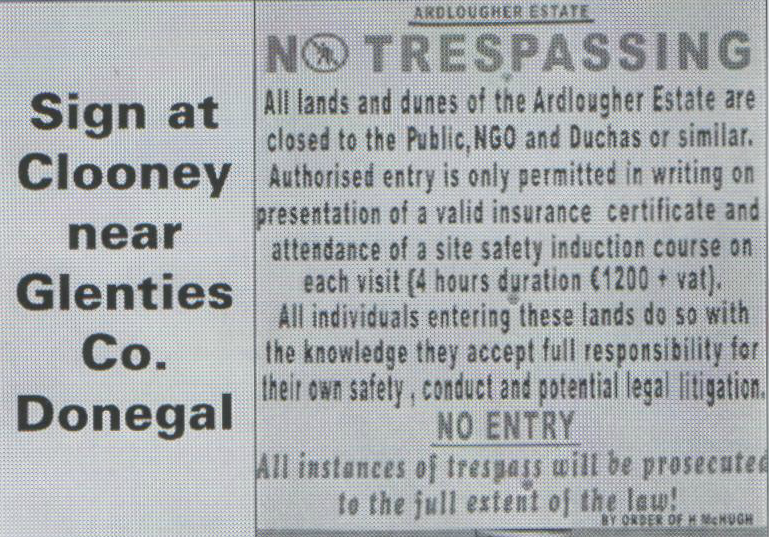 Maybe Ireland needs a mass trespass similar to what happened at Kinder in 1932 and what Lord Roy Hattersley called “the most successful direct action in British history”. What do you think? ...on Hiking, My Thoughts Hiking, Ireland, Kinder, my thoughts, right to roam, trespass, walking. permalink. There re some footpaths in Donegal that are way marked and treated as rights of way, but this is no substitute for a proper right to roam. Nothing will change without mass action. There are waymarked paths spread over Ireland, but they only constitute about a few thousand kilometres and the vast majority of that distance is over tarmac. Even the waymarked ‘rights of way’ are not protected under Irish law and Constitution. The more I research this the more appalled I am at the huge influence the farming and development lobbies have in Irish politics. This is new for me. Mmm I won’t consider Ireland for runs! Thanks Chris for the detailed info. No wonder that on several trips to Ireland I haven’t been able to find anyone able to tell me about rows even tourist offices. During the Lissadell debate a few years ago, I suggested the need for exactly this in Ireland.